So, which one is more effective—Instagram or Pinterest? Looking for a way to drive more traffic to your website? 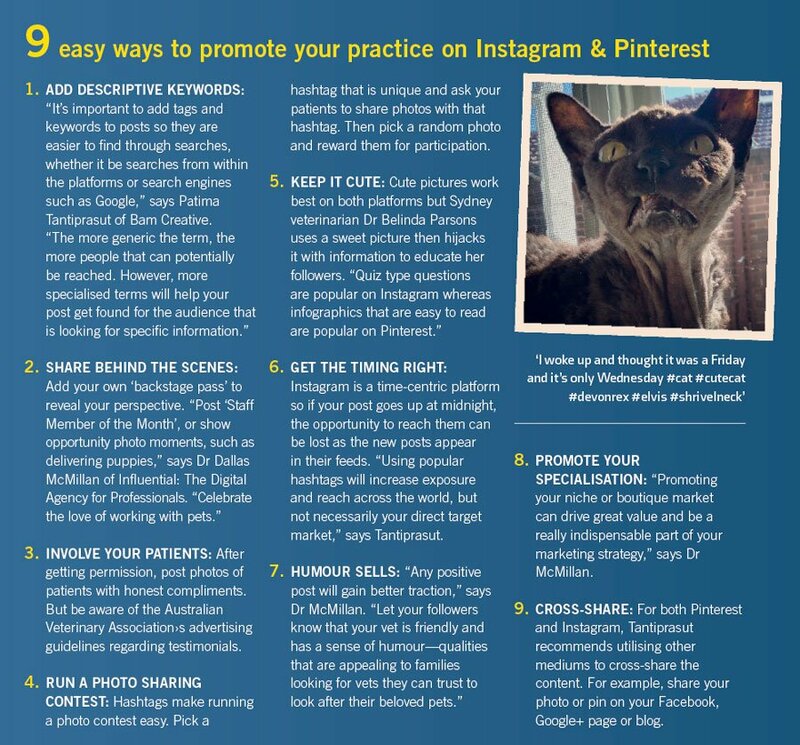 Image-driven sharing social networks, such as Instagram and Pinterest, are the hot ticket, particularly in the veterinary profession. That’s because these apps, which can now be used on computers and devices, focus mainly on images. Cute images of pets, be it a big-eyed pug or a playful Siamese, have major traction. 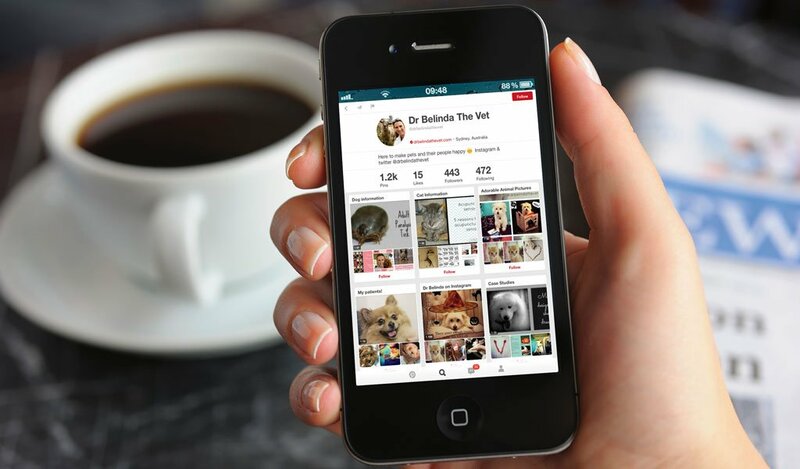 Instagram management platform, Webstagram, proved this in 2013 when nearly 18,000,000 photos of the #dog hashtag appeared, making it Instagram’s 51st most popular tag, followed by more than 14 million photos of the #cat tag. These days, many people don’t believe or trust traditional advertising—instead, they associate with people they believe and trust. This means increased exposure for your brand, which leads to further growth of your veterinary practice. Queensland veterinarian Dr Dallas McMillan, a former partner at Cairns Vet Clinic, recently made a career move—now as a brand strategist, he launched Influential: The Digital Agency for Professionals. And in this field, he’s well aware of the positive aspects of a practice tagging and posting online. Pinterest launched in 2010 and although its numbers aren’t public, most third-party studies peg it at about 40 million active users worldwide—and statistics claim that around 80 per cent of these are female. Instagram also kicked off in 2010, and was acquired by Facebook in April 2012, with over 100 million active users. By December last year, it had jumped to over 300 million users. So, how do they work? Instagram viewers upload photos, videos and micro-blogs—usually taken with a mobile phone or tablet—and add hashtags to make those images searchable. They can also be linked to their Twitter and Facebook accounts so images are instantly shared there too. Pinterest, meanwhile, works as an online pinboard. You can create virtual pinboards of images on specific subjects, such as ‘dog’, ‘pets and vets’, ‘20 food dogs should never eat’ or ‘external pet parasites’. And each image is linked back to the website from where it comes. Another handy trick is ‘pinning’ videos from YouTube. “The visual nature of these platforms can help businesses communicate more quickly and effectively to their audience,” says Patima Tantiprasut. “In this era where people have less time available, the old saying that a picture speaks a thousand words is more applicable than ever. We find that when business owners don’t have the time to plan and write content for the various social media platforms, a photo-sharing option is a much more feasible one. “To the target audience following vet practices on these platforms, whether they are existing customers or not, they see evidence of the passion and care behind the practice which solidifies the integrity of the brand in their eyes. It forms a special familiarity connection that social media platforms uniquely offer,” says Tantiprasut. Dr Parsons also sees the value of Pinterest for veterinary practices. “It relies on you being able to provide your clientele with good quality information that’s pinnable from your website. You need to be thinking about making infographics and attaching them as jpegs—PDFs don’t work on Pinterest. “Think of it as a way to categorise information in pictures. It adds reach to your blog and allows people to easily save information. Most importantly, it allows people to come back and easily find your website and quality correct information.” Dr Parsons spends about 15 to 20 minutes on Pinterest once a week, and just a few minutes a day posting pictures to Instagram. Dr McMillan agrees that posting images and text for Pinterest and Instagram are a “negligible cost”. While some practices prefer having their website professionally designed or hire a website content writer, these won’t break the budget. “Compared to traditional media and sales methods, social media in most instances has a superior cost-benefit proposition,” he says. If you haven’t already got your social media working for you now is the time to take a basic crash course. If your social media message is up to date make sure you’ve got the website to match with top notch SEO.